1. General Appearance and Dress: We make judgments about people based on how attractive we think they are. But standards and judgments regarding attractiveness are subject to cultural variations. Clothing and skin color can also influence how we perceive and communicate with others. 2. Body Movements: All cultures have some system for understanding the meaning of movement. The meanings conveyed via body movements may be different in different cultures. 3. Facial Expressions: People are more likely to interpret facial expressions accurately if they interpret them within the entire communication context. 4. Eye contact and gaze: Our interpersonal relationships are affected by how we use our eyes. Culture modifies how much eye contact we may engage in and with whom. 5. Touch: The meaning inferred from touch is influenced by such factors as the mood or state we are in, relationship with the toucher, past history, duration of the touch, location of the touch, whether the touch is active or passive. The duration, frequency and location of touch are largely culturally based. 6. Smell: Cultures perceives odors differently and assign them different meaning and importance during interaction. 7. Paralanguage: How something is heard and vocalized vary and hold different meanings in different cultures. vocal segregates (uh-huh, shh, oooh, mmmh). "Communication is far more than speech and writing. Most of us are unaware that we are communicating in many different ways even when we are not speaking. The same goes for many other social animal species. We rarely learn about this mostly non-verbal communication in school even though it is very important for effective interaction with others. Growing up in a society, we learn how to use gestures, glances, slight changes in tone of voice, and other auxiliary communication devices to alter or emphasize what we say and do. We learn these highly culture bound techniques over years largely by observing others and imitating them." "The most obvious form of paralanguage is body language or kinesics"
"When we speak to another individual or group, the distance our bodies are physically apart also communicates a paralanguage message. Proxemics is the study of such interaction distances and other culturally defined uses of space." expected to arrive on time, if not early. Higher status individuals can expect that others will wait for them if they are late."
. In urban Canada, (Toronto, Montreal and Vancouver) there is an extremely high percentage of the population that is ethnically diverse - as a consequence, cultural concepts in time vary greatly. In some Caribbean and Latin American cultures, a time for meeting (eg. 8:00 pm) would be considered only a "ballpark" figure and it could be possible that people will arrive at 8:30 pm, 9:00 pm or later and it would not be something you have to apologize for. Ordinarly this is not a problem when people of the same ethnic background are communicating but when the people involved cross over several cultural communities, differing expectations can lead to frustration and disappointment. "clothing has multiple functions. It is used to provide protection from the elements. It also is worn for modesty, usually to prevent others from seeing specific parts of one's body. However, the parts of the body that must be covered vary widely throughout the world." "When traveling to other societies, it is important to understand that there are likely to be significant gender differences in paralanguage in addition to clothes and adornment. In North America, for instance, men generally prefer face to face conversations and maintain direct eye contact longer. In contrast, women often converse standing side by side but closer together than is typical of men. Male hand shakes tend to be firmer. North American women usually are more restrained in their use of bold gestures but use more facial expressions (especially smiles) and are more skilled in interpreting them." 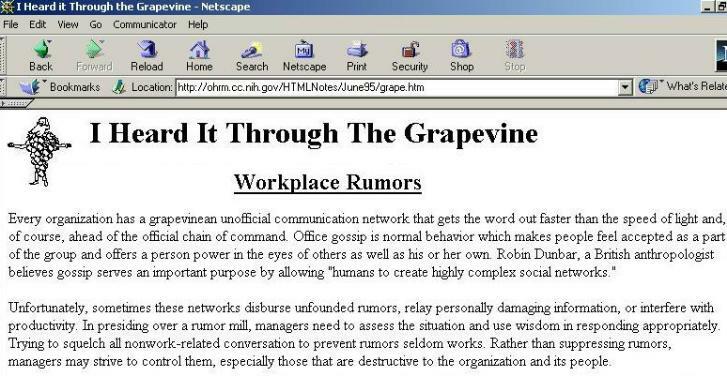 try "Practice Quiz for Hidden Aspects of Communication"
click the media player to the left to hear the song "heard it through the grapevine"